On 5th December 2012 I had fire in my flat and I had made a claim to the Zurich Insurance Plc. After many months of works, delays, damages and incompetence I am still living in a hotel (booked until 14th May 2014). Since the fire on 05th December 2012 I had changed accommodation 8 times (friends->hotel->rented flat->my flat->hotel->my flat->hotel->hotel 2) and I will have to do that for at least 1 more times (hotel 2->my flat). 1) On 07th December 2012, Mr Paul C. from Capital Services Ltd told us to remove the building debris which was not our responsibility after the fire. The schedule of works that was given to me by Capital Services Ltd had no reference to the debris and its safe removal from the site. As a result my flatmate and I had to remove the debris and we now have chest pains while one of us had needed medication for asthma. 2) On 07th December 2012, Mr Paul C. from Capital Services Ltd did not inform us of the possible asbestos on the property. This had as a consequence an unnecessary and potential lethal risk since we had been instructed to clean the property before the asbestos survey carried out on the 17th January 2013 by Aspect Contracts Ltd.
3) On the 24th May 2013, the electrician from Capital Services Ltd told us that the flat was inspected and it was ready from his point of view. A certificate was ready to be sent to me according to Mr Kenny W., project manager for Capital Services Ltd. However when my electrician from PGS Services Ltd came to do some other jobs he mentioned that there was no bonding between the mains water and the fuse box and no bonding between the gas and the fuse box. Because of that he refused to do anything electrical inside the flat and as a consequence I lost more than £100. In the end, the PGS Services electrician had to speak with Mr Kenny W. and the electrician from Capital Services Ltd. Finally after a lot of discussions and arguments the contractors’ electrician did the bonding as well as the job that my electrician was supposed to do at a later date. Even after all those repairs and works we had flickering lights and part of the board was failing every time we used an electrical appliance. However, on 18th December 2013, Mr P. M., BRICS Contractor Manager from GAB Robins Ltd informed us that: “Bonding was not required as a consumer unit had RCD protection”. We are waiting an official answer from IET Electrical regarding the bonding requirements under the BS 7671:2008(2011) standard. We also made an official complaint to NICEIC regarding the inaccurate certificates that I have received (see point 11 below) . 4) On September 2013, the newly installed wooden floor which is part of the building was in pieces only two months after they had installed it. We almost had two accidents while we were trying to jump the broken wooden pieces on the floor. Capital Services Ltd claimed that the problem was trapped moist under the floor. However there no water under the hallway floor at any time before, during or after the installation. This indicates that the drying company or someone else did not complete their jobs in a satisfactory way. Another possibility that brought to my attention on January 2014, is that the flooring contractors may did not allow the Arditex NA Latex to dry properly and they installed the wooden floor before all the moisture and condensation was removed. Please have in mind that the hallway floor was installed very quickly (within a couple of days) including the installation of the Arditex NA Latex and BAL F76. 5) On July 2013, I noticed that the bathroom had broken tiles since day one. During the meeting with the Loss Adjuster and Capital Services Ltd, I was told by Capital Services Ltd representatives that I had to be grateful for having all of these broken tiles for free. I had protested since I always paid my contributions every year via the Camden council’s service charges. 6) On July 2013, the cistern mechanism malfunctioned and as a result my bathroom floor was flooded. My newly installed wooden floor was full of water and it was damaged. Again I was told to be grateful for the new cistern mechanism that had failed two days after I had moved in! 7) On 29th November 2013, contractors from Capital Serviced Ltd might have thrown some chemicals inside the sink against the English Regulations that state that all hazardous chemicals have to be disposed in a proper way. Those chemicals seems to have melted my pipes and leaked on the floor. They might also have blocked the communal pipes. 9) On 09th December 2013, Zurich Insurance Plc and GAB Robins Ltd proposed a plan in order for us to move back into the flat during the Christmas 2013 and then move out again in February 2014 for the final works. However, Ms Lisa S. had repeatedly refused to put that in writing and only when I threaten them with legal action Mr P. M., BRICS Contractor Manager from GAB Robins Ltd replied. 10) On December 2013, Ms Lisa S. from Zurich Insurance Plc had repeatedly said that the wooden floor works could continued while there was still condensation inside the flat. She did not change her mind even when I mentioned that there was water on the floor. I disagreed with her and Mr Ricky from The Revival Company confirmed the same in our telephone conversation on the 23rd January 2014. 11) On 16th December 2013, Capital Services Ltd had issued some minor works certificates that were completely wrong. The dates, the works description and the postcode were wrong. As for the rest of the information on the certificate we could not verify their correctness or validity. However all the above errors do not transpire confidence. 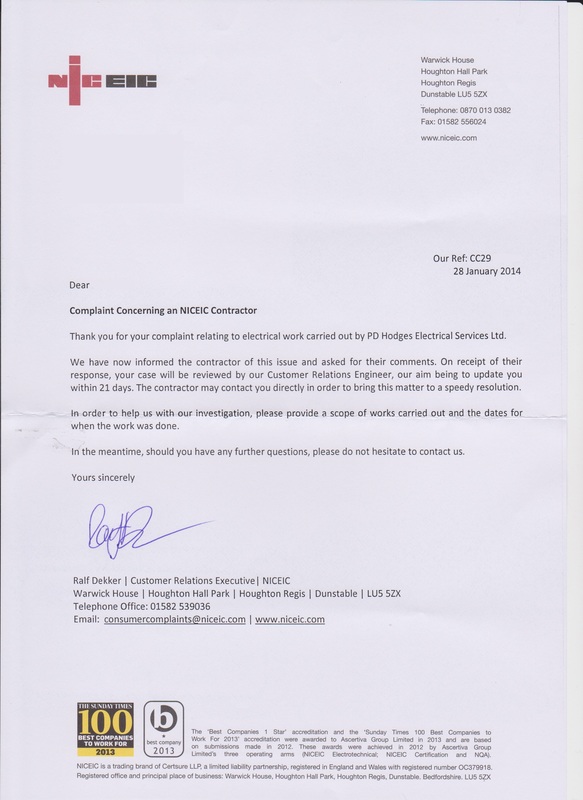 We also made an official complaint to NICEIC regarding the inaccurate certificates that I have received. 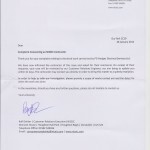 The last update was received on the 28th January 2014 and can be found on the letter shown on the left. The NICEIC has requested more information from the electricians regarding the inaccurate certificates. Mr Ralf D. From NICEIC claims that P D Hedges did the bonding because it was not there originally. That means that Capital Services Ltd did not do the bonding and that my photos after the works are fake. Read more here. 12) Since November 2013, GAB Robins Ltd and Zurich Insurance Plc do continuously delay to pay the expenses for an unreasonable period and without any explanation for the delays. 13) On 19th December 2013, Mr P. M., BRICS Contractor Manager from GAB Robins Ltd visited my property and without even checking the schedule of works accused me that I have removed the toilet downstairs and not his contractors. 14) On 20th January 2014, the contractors started the works for the floor installation without protected the stairs and upper floor adequately. They also damaged the main entrance door further. 15) On 21st January 2014, the contractors installed the new adhesive but they did not do enough to prevent the creation of condensation inside the flat. This had as a result delays and possible damages to the other wooden floor on the landing and upper floor. After some investigation with the manufacturer of the materials we found that condensation is not unusual in contrast with Mr P. M., BRICS Contractor Manager from GAB Robins Ltd views that my flat is unique. Mr P.M. also insisted that his professional contractors have never had condensation in any other installation during their 30 years experience. 16) On 28th January 2014, Zurich Insurance Plc has not responded or answered my complaints within the timescale that they advertise on their website. I have submitted two complaints via Ms Lisa S. (Senior Property Claims Handler of Zurich Insurance). The first one was on the 18th September 2013 and the second was on the 03rd December 2013. None of them has been addressed or answered within the 8 weeks timescale of the insurance’s regulations. 17) On 06th February 2014, I have realised that the source of the problems might be the wrong or incomplete installation of the windows frame inside the living room since the huge gaps on each side of the frame have allowed water to enter the property after a bad weather of constant raining and winds. Why those jobs have not been done in the first place? On the 27th January 2014 Mr P.M. stated that the condensation in my flat was UNIQUE. However both Mr Ricky from The Revival Company as well as the manufacturer of STOPGAP 300 said that it is not unusual or unexpected to have condensation after the installation of 150Kg of that material mixed with 28 litres of water. On the 06th February 2014 Mr P.M. told me that the windows have been installed in a “professional style” when I complaint about the two huge holes on either side of the windows. Subsequently he admitted (26th February 2014) that the windows did not installed in a “professional style” and that the water has to drain outside the property. Since the 24th January 2014 I am trying to have answers to my questions regarding the floor preparation. On the 04th March 2014 we found out from the manufacturer that the floor was NOT installed according to the manufacturer’s standards as per Mr P.M.’s emails. 19) On 5th March 2014, after the meeting with GAB Robins and Zurich people I discovered that the floor subcontractors had lied to me. They claimed that the F76 was not damaged when they removed the Stopgap 300 HD. However, when they remove the Stopgap again the F76 was not there at all. A green material was there instead of the blue F76. Read more. 20) On 28th March 2014, the Mr Nick H., Building Services Technical Director from GAB Robins Ltd, did not deliver the photographic evidence that he had promised in writing. Those evidence were one of the important conditions for me to agree for the continuation of works with the same contractors that had lied to me before (see above point 19). Obviously there wasn’t any trust between the parties and the photographic evidence was requested in order to make sure that the jobs were completed as per the schedule of works. 21) On 29th March 2014, the floor contractor managed to destroy the floor again in exactly the same way as they did on July 2013. Read more here. 22) On 31st March 2014, the sub contractors has left the toilet’s wooden floor wet. Then they covered it with plastic protective sheets and seal it all around with tape. The water wouldn’t be able to dry naturally and if I was not there to remove the plastic cover and dry the floor with paper the damages would be greater. 23) On 01st April 2014, I discovered that the subcontractor had damaged my wooden stairs during their works. This was achieved because the stairs were never protected properly as per my written and verbal requests. 24) On 11th April 2014, Mr Gary D. from Zurich Insurance admitted that insurance did not act properly concerning the removal of the Lock Box. He admitted that they wasted police time and their own money for nothing.